ALS-style pucks and tools for remote data collection at select beamlines around the world. See our beamline guide for help determining the best puck system for the beamline you are collecting data at. Original Puck (for use with ALS-style robots only) The ALS-style Puck is a sample pin storage and shipping container compatible with ALS-style sample mounting robots. (This container should not be confused with the V1-Uni-Puck which is compatible with a variety of sample mounting robots.) The puck holds 16 sample pins. It consists of two parts shown in the image below: 1) the sample enclosure (left) and 2) the sample base piece (right). Only the sample base piece is magnetic. *Note: ALS-stlye Pucks come standard with engraved serialization (e.g. CPS-0583). If specified at the time of purchase you have the option to have the pucks custom engraved at no extra charge (order part number M-CP-CENGR above). The format for the custom engraving is limited to three (3) CAPITAL letters then a dash followed by four (4) numbers. Here is an example, ABC-1234. For online orders you can add this detail in the comments field during checkout. Bulk pricing options are available. This loading dewar has space to hold two uni-pucks and is double sided. This set includes a uni-puck shipping cane, shipping spacers and clip. This set is for safe shipping of pucks to synchrotron sources and is compatible with most commercial dry shipping dewars. Up to 7 pucks may be shipped using this shipping cane. When less pucks are shipped, the corresponding Styrofoam spacers should be used to hold the pucks in place. The entire set which includes a puck shipping cane, Styrofoam spacers and Teflon clip is shown in the photo below. To use the puck shipping canister set, stack uni-pucks or pucks on the cane, hold them in place using the Teflon clip, and then add the appropriate Stryrofoam spacer. Insert this entire assembly into a properly charged dry-shipping dewar and cover with the standard dry-shipping dewar lid. This set includes a shelved shipping cane, locking rod and hooked handle (shown below). Seven pucks or uni-pucks may be shipped or stored in this cane. Remember to always insert the locking rod when shipping pucks in dry-shipping dewars. This set of tools includes a base removal platform and a porcupine push tool (as shown below). These tools are used to separate pucks or uni-pucks. This this tool is used to separate pucks or uni-pucks to load them into the ALS-robot dewar. It consists of two pieces: a Teflon tube part and a metal rod part as shown below. 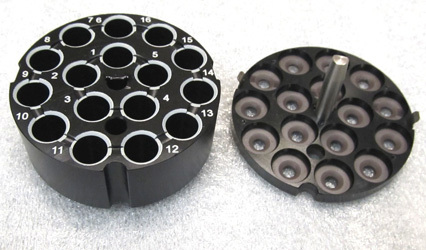 Sample pins are held into the V1-puck enclosure ports by nickel coated NdFeB ring magnets (10.4 mm OD, 7.6 mm ID x 2.5 mm). These magnets are held in place by removable polycarbonate washers. These magnets and washers are also used in the SSRL cassette. A different stronger ring magnet is used to hold sample pins on the cover side of the V1-puck. Replacement V1-puck magnets and washers are available for online purchase.